Have you thought of having your hair done at your local food market? Or maybe, getting your nails painted? Or better yet, buying yourself a nice gold plated necklace at the market? 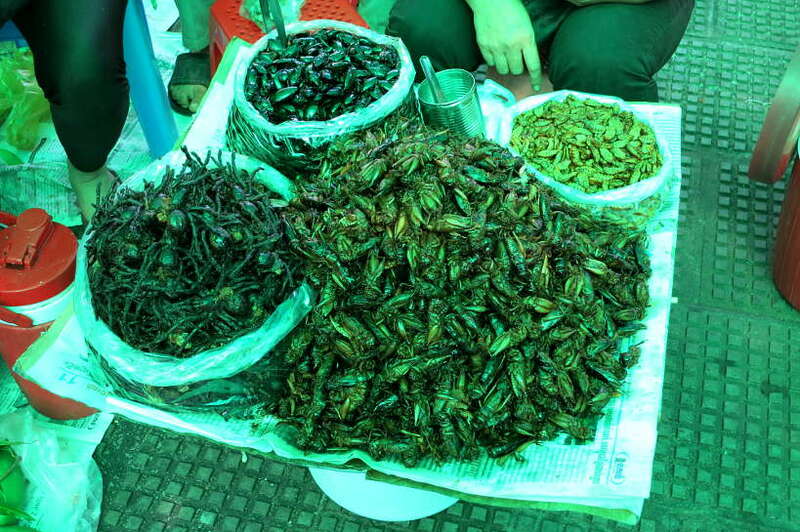 Well, in Cambodia the local markets offer all of the above. 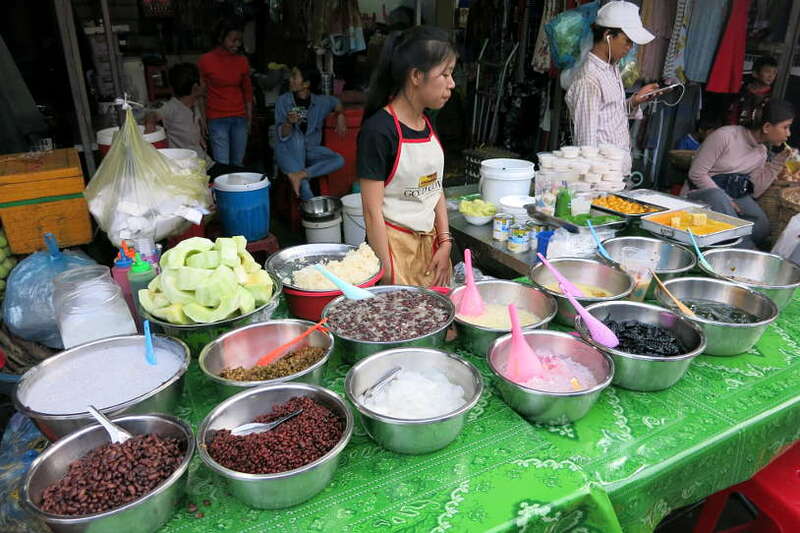 Even more so than local markets we have visited in Thailand, Vietnam or the Philippines, Cambodian markets have unusual and unexpected stalls. Visiting the local Phnom Penh market gives you the opportunity to immerse yourself into the flavors and the cultural nuances of Cambodia. And there is no better way than by wandering slowly through the market stalls. 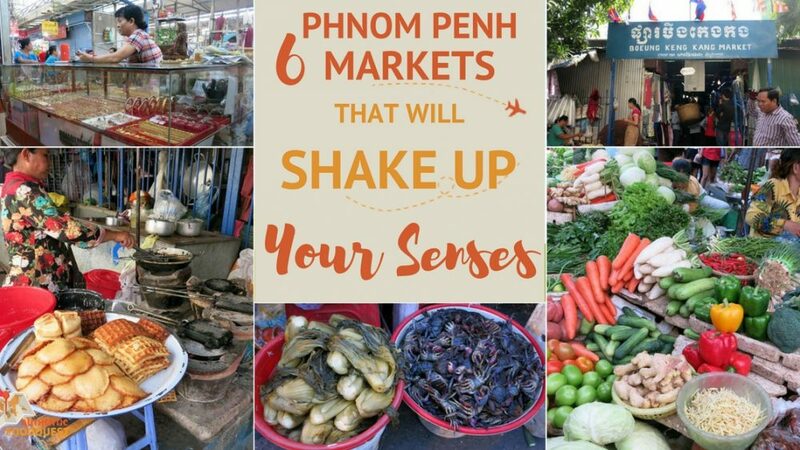 We invite you to explore local Cambodian flavors and surprising finds at these top 6 Phnom Penh markets. 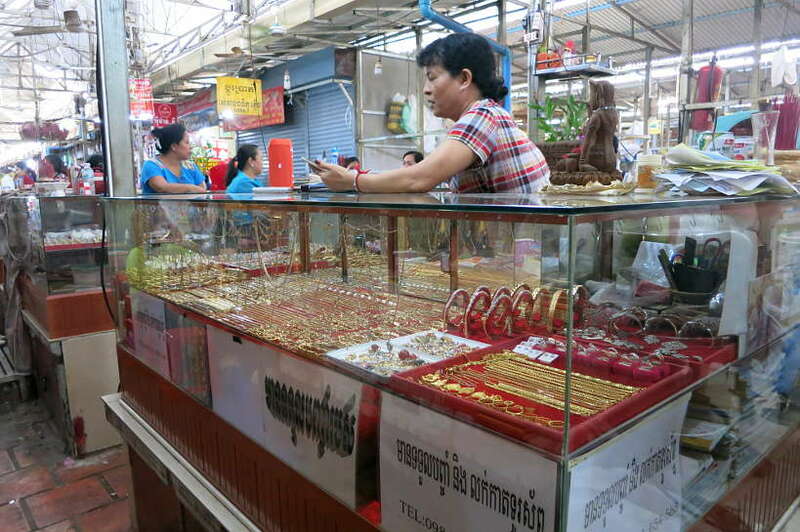 Check out the gold plated jewelry at BKK market. 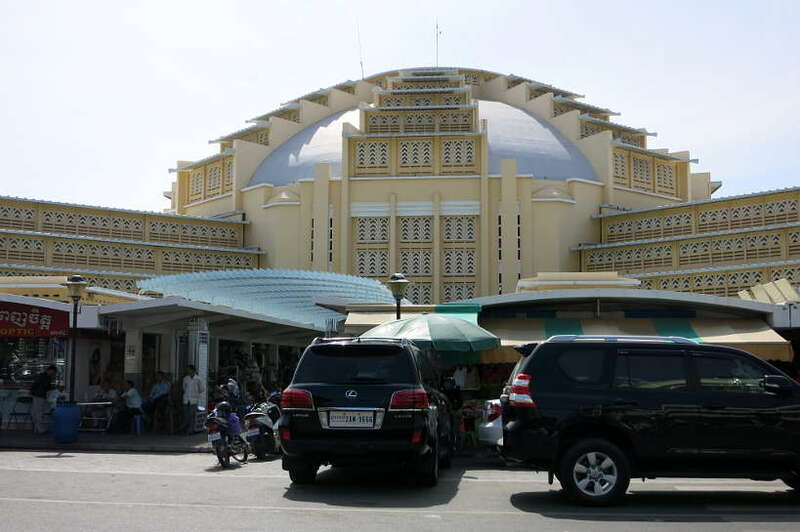 Central Market is probably the most iconic and distinct Phnom Penh market. With its unique central dome connecting to four wings, you will notice it from far as you approach it. Built by the French during the colonial period, it was designed to maximize ventilation in the hot and humid climate of Cambodia. When it opened in 1937, it was said to be the largest market in Asia. 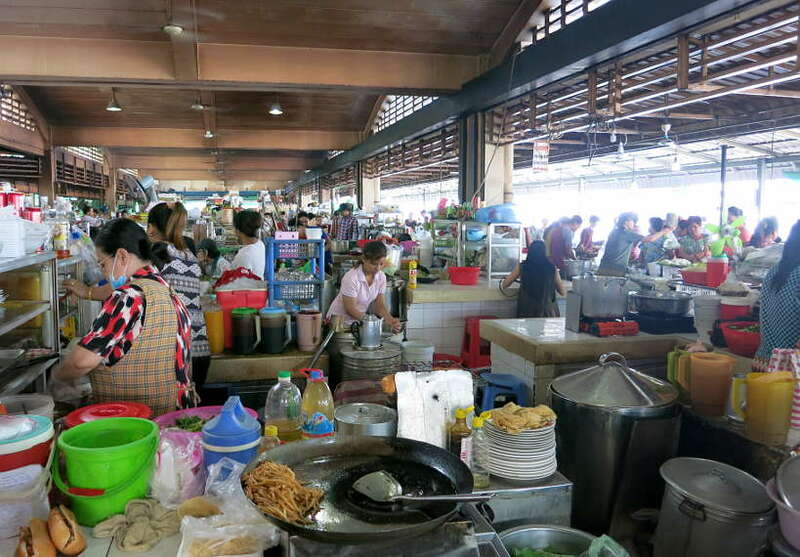 Today, it is definitely the cleanest and most airy market you will find in Phnom Penh. 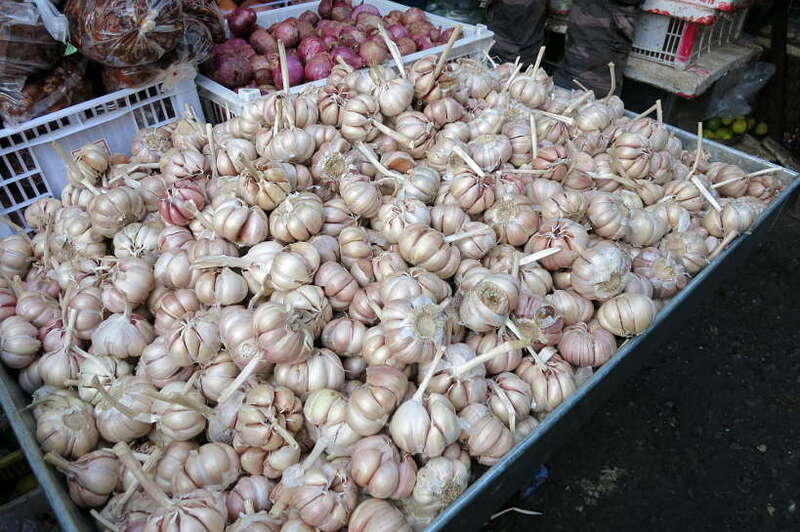 It is also one of the best markets to ease you in the local food. A large section of the market is dedicated to jewelry vendors, electronics, clothing as well as other accessories like watches, bags and more. 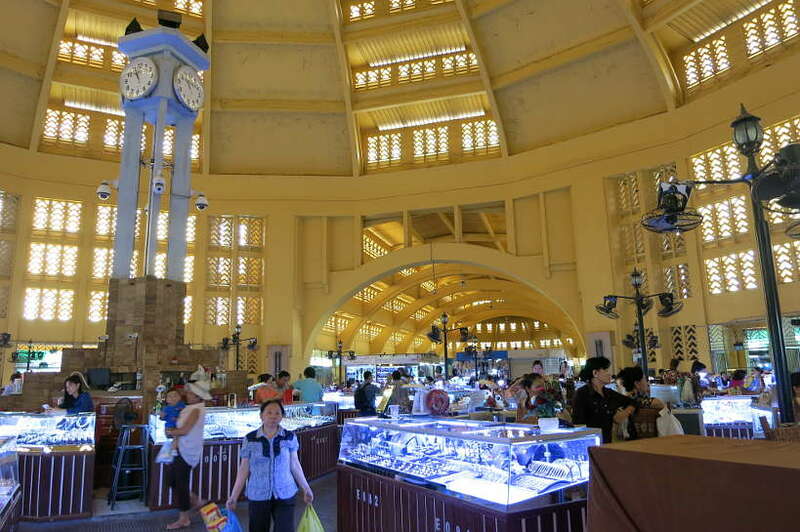 Central Market also has a dining area where you can choose from plenty of food stalls. Each stall tends to specialize in one type of dish. 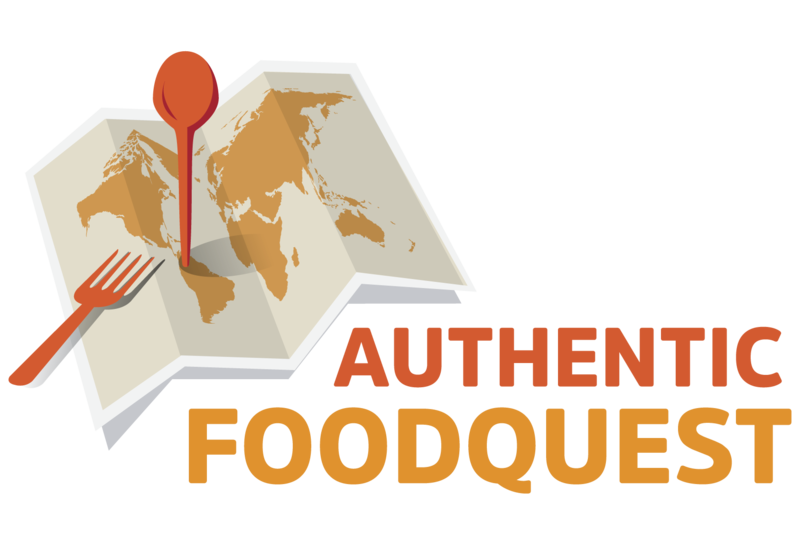 From noodle soups, BBQ or desserts, you’ll be sure to find something to your liking. Next to this section, find fresh fruits and vegetables as well as dried foods and insects. 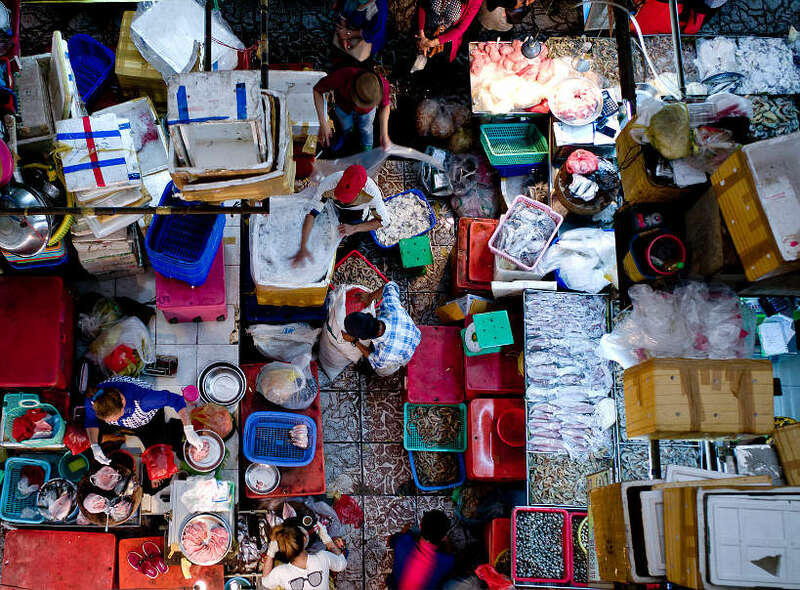 We recommend Central Market as the best place to start your journey in Phnom Penh. You will visit one of the historical buildings of the city, and also taste the culture through the local specialties like kuy teav or bobor. Tuk-tuk is the local means of transportation in the city. A ride from the Independent Monument should not cost your more than $4 and about 10 mins. Address: At the intersection of St 128 and St 63, Phnom Penh. Hours: Everyday from 7 am to 6 pm. 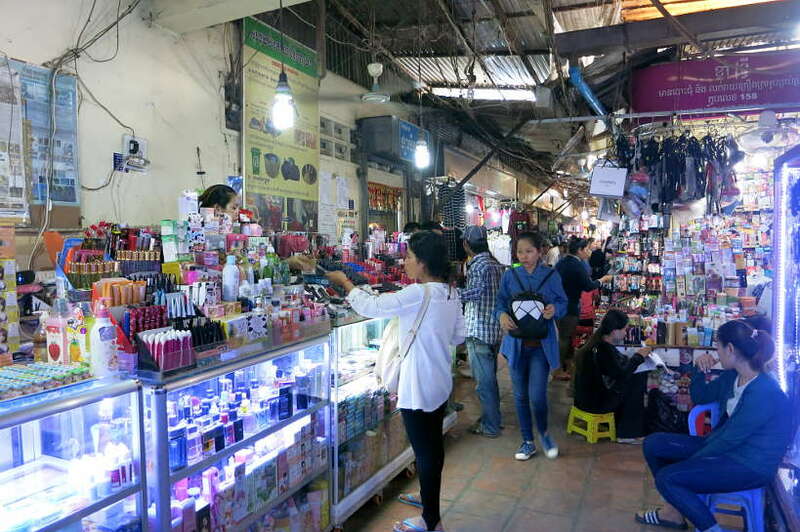 The Russian Market (or Phsar Tuol Tom Pong) might be the most famous Phnom Penh market for souvenirs and clothing. While it’s a great place for tourist to find gifts, it’s also a great market for street food and local food, especially at dusk. Why is it called Russian Market? Apparently, in the 1980’s the market was popular with the local expat community which was made up of Russians living in the area. Russian Market is unlike Central Market. 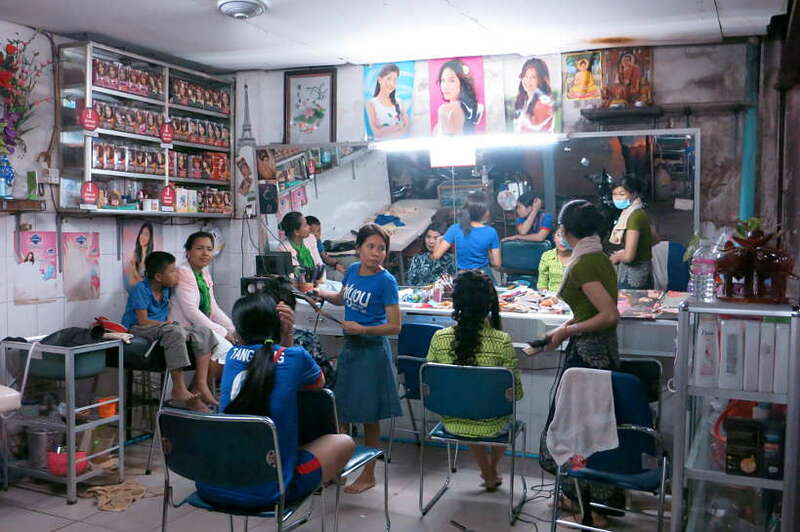 It is not well ventilated, the lighting is limited and the alleys narrow. 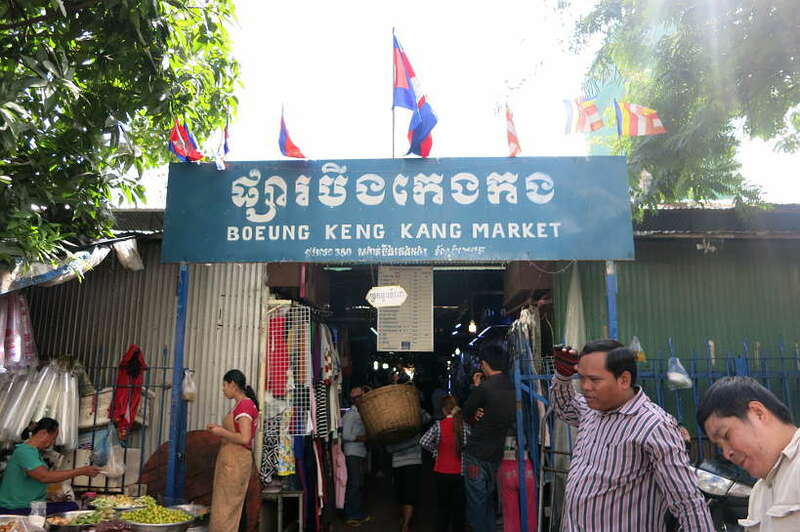 This market will give you a feel for the typical atmosphere of a local Cambodian market. When it comes to the food, things start getting interesting after the inside market closes at about 5 pm. On the outside, around the market, you will find all sorts of food vendors. On one side you can buy household products and on the other, fruits, vegetables and seafood. 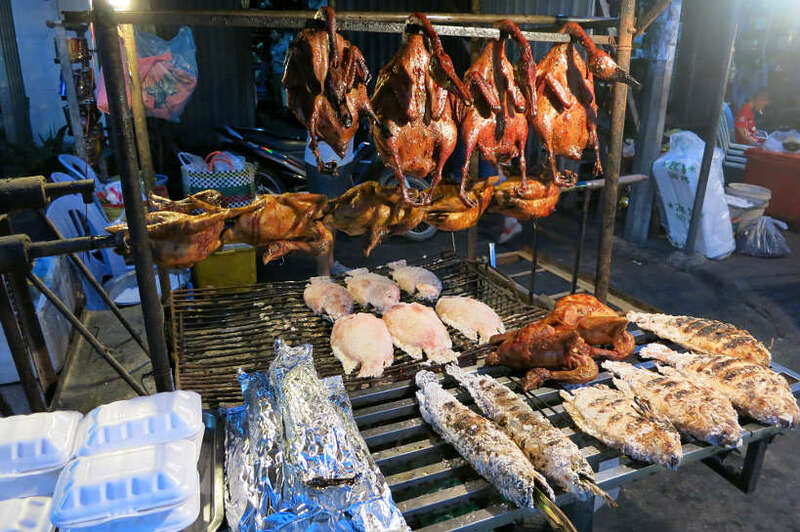 While on the other side of the market, you will find BBQ grilling chicken, Tonle Sap fish, squid and more. Get there before the market closes to have a look on the inside. At dusk, take the time to walk around the market, find interesting treats to taste, before you settling in to enjoy a seafood BBQ dinner! A tuk-tuk ride from the Independent Monument should not cost your more than $5 and about 15 mins. Hours: Everyday from 7 am to 5 pm. Kandal Market is an authentic, local market in the center of Phnom Penh, just off the riverfront, not far from the Royal Palace. The interior of the market is covered, while the outdoor area is a chaotic mess. Negotiations are happening in foreign tones and people move quickly through the small and narrow walkways.You’ll see very few tourists here if any. The market is filled with clothes and shoes, but the majority of it is dedicated to fresh meats, produce, and fruits. We stopped by as the market was closing, and saw vendors selling hot food and fruits. 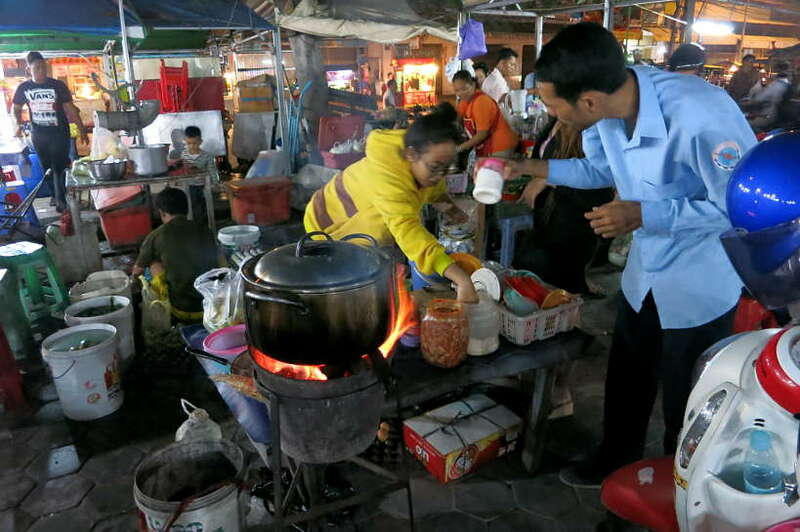 It was here where we tried for the first time, Lort Cha, a popular Cambodian street food. This delicious dish is stir-fried noodles, cooked with bean sprouts, Chinese broccoli, and chives, with beef and a fried egg. 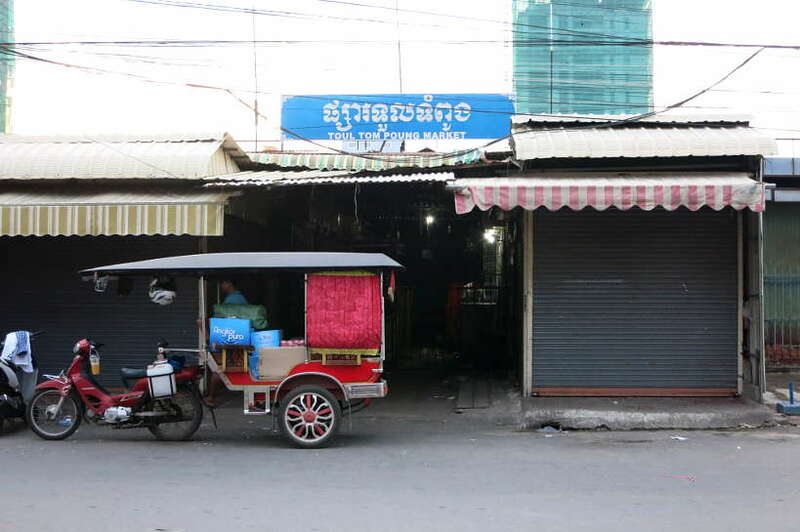 At Kandal market, be prepared for the unexpected. The hygiene level is also questionable especially compared to Western standards. Nonetheless, don’t let this stop you from immersing yourself in the local culture. 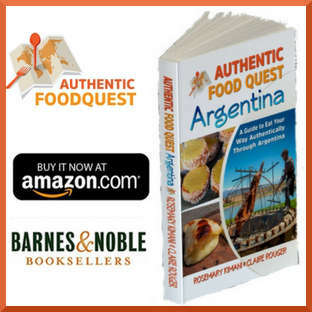 Take in the sounds, unfamiliar sights and enjoy the local food specialties. A tuk-tuk ride from the Independent Monument should not cost your more than $3-$4 and about 10 mins. This market really surprised us. 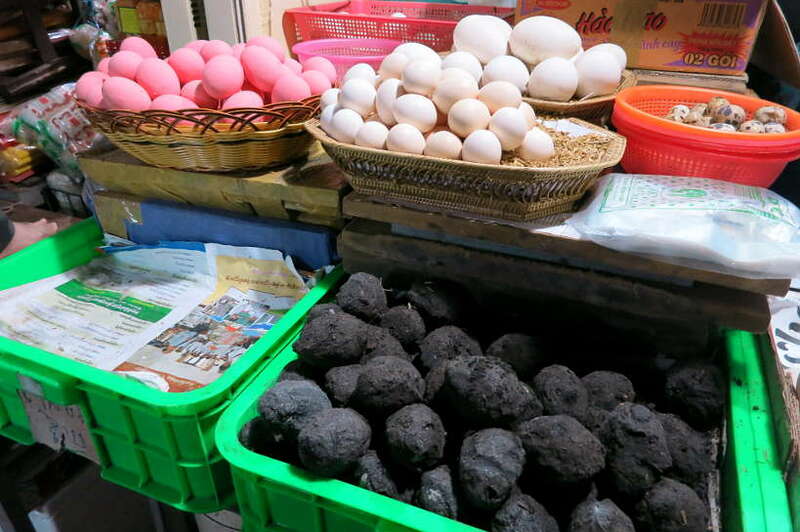 While on the hunt for a food market, we stumbled onto what locals call BKK market and found a lot more than food. It was an organized mess of all different types of stalls. Jewelry, beauty products, clothing, shoes and more. Walking into the narrow aisles, were fruit and vegetable vendors carefully organized between stalls of clothes and fashion. We learned later on that the market is popular for vintage fashions at affordable prices. As we made our way through the stalls, at one end we came across a strange, circular fruit. We tried asking about the fruit, but unfortunately, could not communicate with the vendor. She did nonetheless let us try the fruit. After peeling off the skin, you are left with a seed covered with white flesh. We found the taste not to be sweet, but rather on the dry and slightly acidic side. Quite an interesting experience seeing and tasting this unusual fruit. UPDATE: Thanks to an Authentic Food Quest reader, the strange fruit has been identified as Monkey Pod” or “Madras Thorn”. It is available in South India and in Tamil, it is called seeni puliyangai. 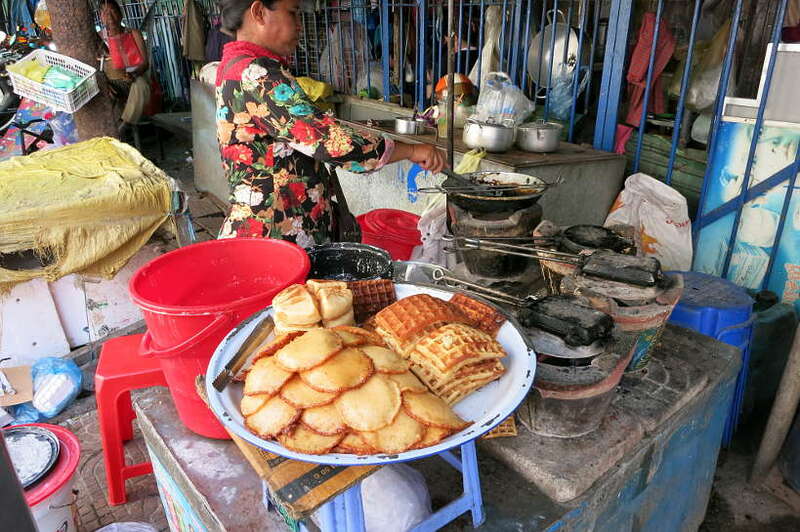 Along the perimeter of the market, are women selling “waffles” and an assortment of other local treats. We didn’t try the waffles, though they did smell quite inviting. A tuk-tuk ride from the Independent Monument should not cost your more than $3 and about 10 mins. 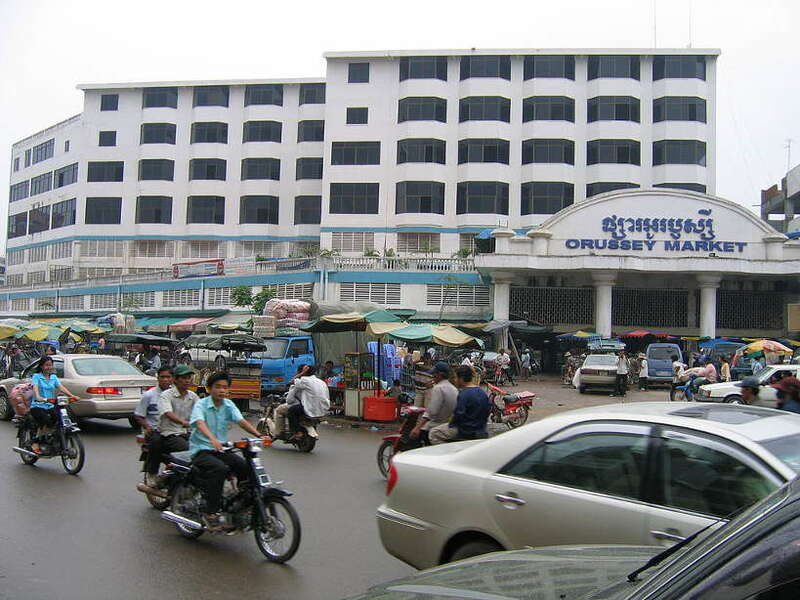 Orussey Market is the biggest market and commercial center in Phnom Penh. 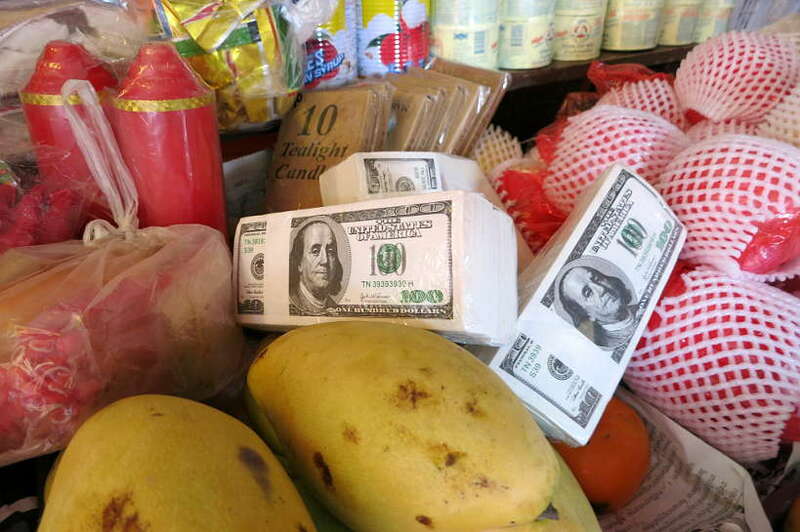 You can find anything you need at Orussey market! Located on the North side of the Olympic Stadium, it is mostly frequented by locals. Orussey market is housed in a large square building on three levels. You will also find shops and food vendors outside the market. This is a great market to get the pulse of the city and have a feel for the local eating habits. You will not find many souvenirs or touristy items as the products are mostly household items geared toward locals. In the food section, you will find everything you need to fill up your fridge. There is a wet market with meat, poultry, and seafood stalls as well as stalls selling fruits, vegetables and household products. A tuk-tuk ride from the Independent Monument should not cost your more than $4 and about 10 mins. Hours: Everyday from 6 am to 5 pm. 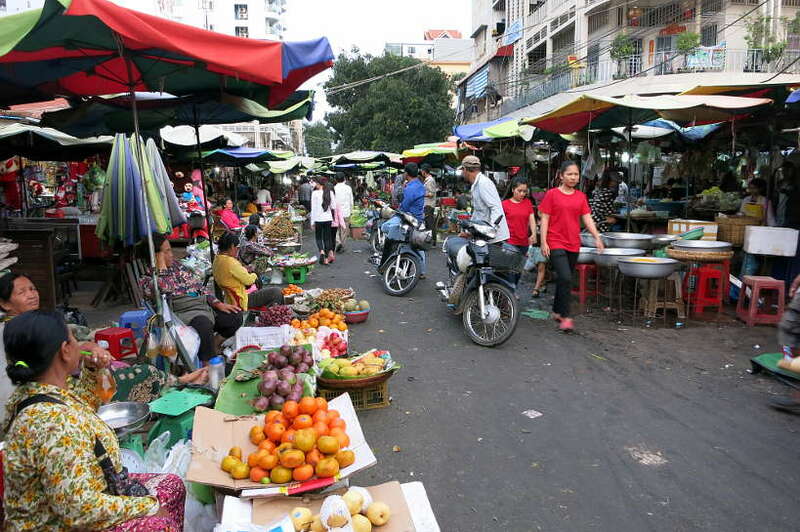 Thus far, we have presented five markets to visit in Phnom Penh. There are actually many more spread out throughout the city. You might discover the next market gem located in the neighborhood you are staying. For us, we discovered Kabko market while staying at our Airbnb close by. We stopped by after a lunch at Phsar Kabko, a local Cambodian restaurant we recommend. Like most local Phnom Penh market, this one rather small was filled with fresh fruit, produce and an odd stall or two selling clothes or other accessories. Get there late in the afternoon or early evening as food vendors and fruit sellers set up their stalls to cater to the evening crowd. This a great traditional market to browse and shop. You could literally walk from the Independent Monument to the market located about four blocks away. If you take a tuk-tuk, it should not cost your more than $1-$2 and about 3-5 mins. 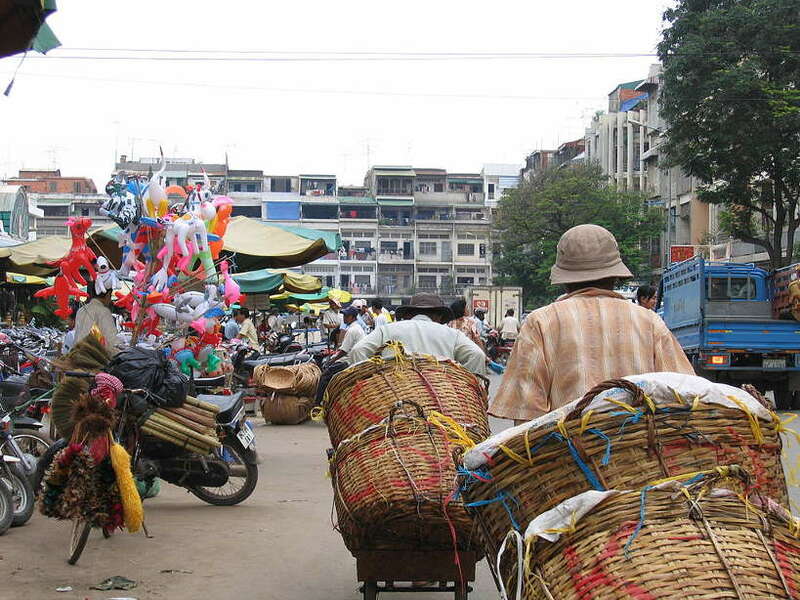 Wandering through the Phnom Penh markets is a great way to get a feel for and taste of the local Cambodian culture. With fresh vegetables stacked high to unusual fruits on displays all of this intertwined with beauty salons and gold jewelry stalls. The markets in Phnom Penh are unlike others. The large selection of fresh seafood, fish, and meat—some of which is still moving— can be overwhelming to some. But that’s what gives the local and authentic flavors of the place. If your travels take you to Cambodia, be prepared and adjust your expectations. Go with the flow and see what delights you discover. 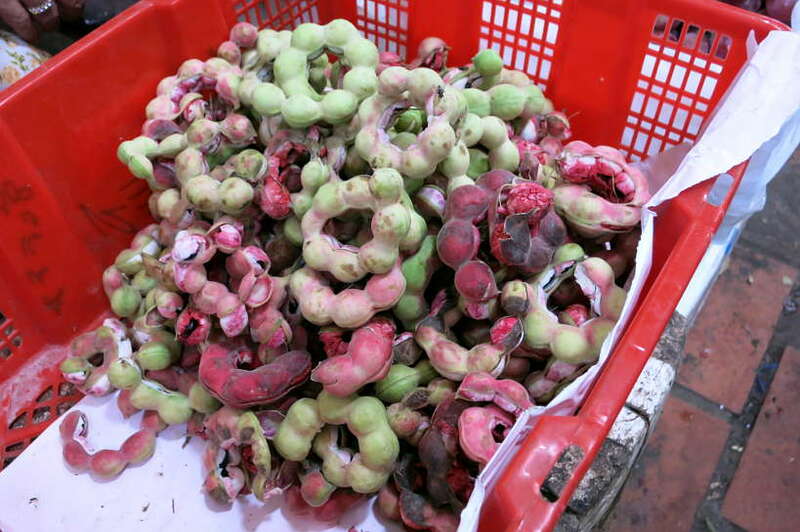 If by chance, you find the name of the strange fruit we discovered at Kandal market, please do let us know. Do you visit the local markets on your travels? What’s the most surprising things you’ve seen from your most recent trip? Share your comments below. I love the look of those strange fruit. Wandering markets is a great way to get a sense of a city although sometimes they can be crazeeeee!!! You are right, the vegetables and fruits are strange, but the experience is amazing. Local markets are must to visit!! Thanks Anne. Indeed, visiting the local markets can be quite an experience….though a lovely introduction to a local culture. Any favorite markets? Awesome to read your feedback Danik. 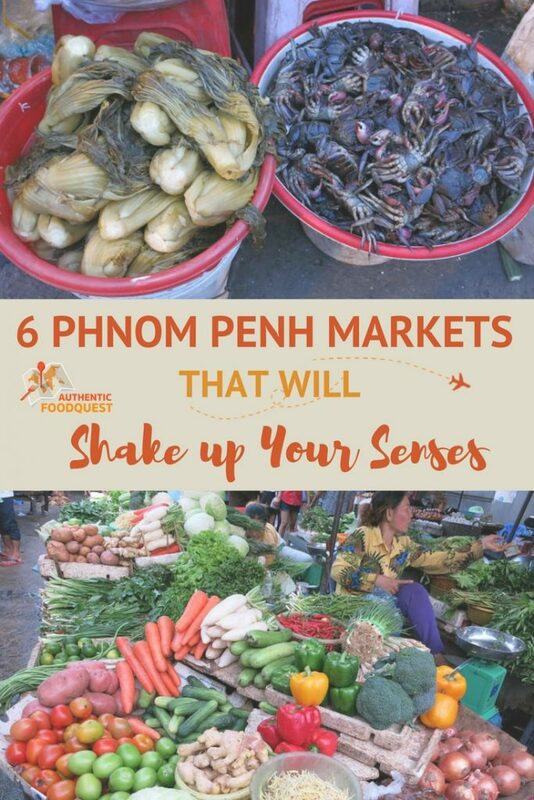 When you do make it to Phnom Pehn, do check out these unique and amazing markets. Thanks so much!! I love that you can get your nails done, buy some jewelry, then get food all in the same place! 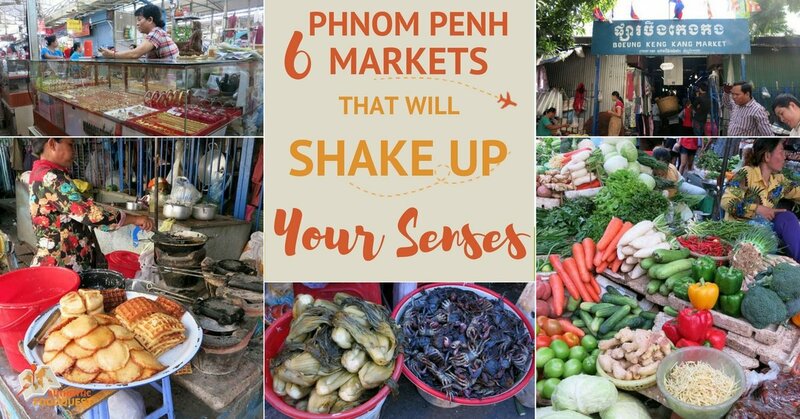 We missed out on the market scene when we were in Phnom Penh, I would love to go back and check it out! As for that mysterious fruit, it sort of looks like Tamarind but it has that unusual circle shape (almost like something a baby would use when teething! haha). I am curious as to if anyone can correctly identify it! Thanks for taking a stab Megan at that fruit. Agree, it looks like Tamarind, but it’s not. At least we can agree it’s in the Tamarind family. Bummer to read you missed out on the local markets while you were in Phnom Pehn. A trip back, perhaps?? Appreciate your comments. I would be in food heaven walking amid those markets. That ring fruit you guys tried would definitely be on my list of weird things I have to try. Do you haggle with the prices like in other Asian markets? In Cambodia, you certainly need to haggle. There are 3 different levels of pricing – for locals, for expats, and for tourists. Knowing even a few words in Khmer comes in handy. The markets are absolutely an experience and a lot of fun to explore. Any thoughts what that fruit might be? Cheers. I love and hate when your blog comes up in my mega share feed. 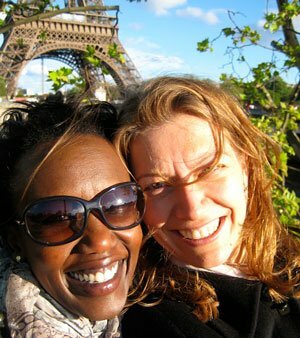 Love the delectable photos and tasty stories, hate that they make me hungry! At any rate, as much as I dislike going to outdoor markets in the US, I love doing that abroad. Glad you like the article, Peter. Out of curiosity, why do you dislike the market in the U.S. We find the neighborhood and local markets in the U.S. quite charming. Very different though than the markets abroad! Thanks for stopping by. 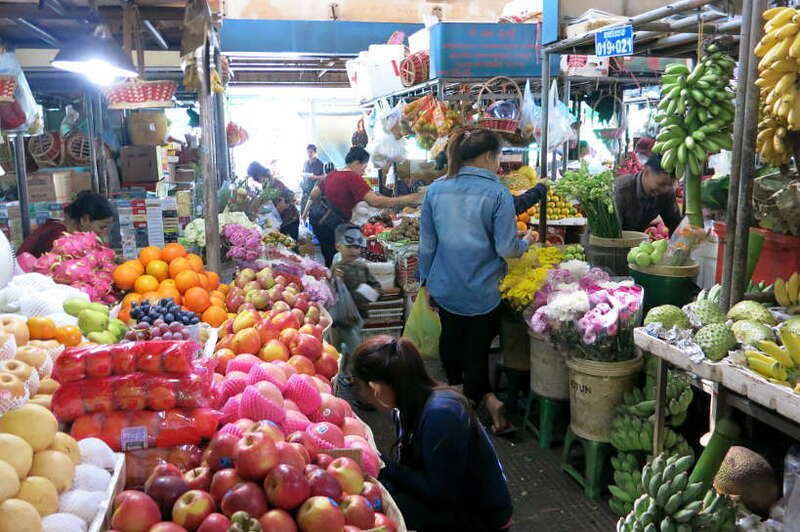 I was only in Phnom Penh for a short time and only made it to the Central Market. I was so surprised by the variety of vendors. The vast selection of jewellery was crazy! 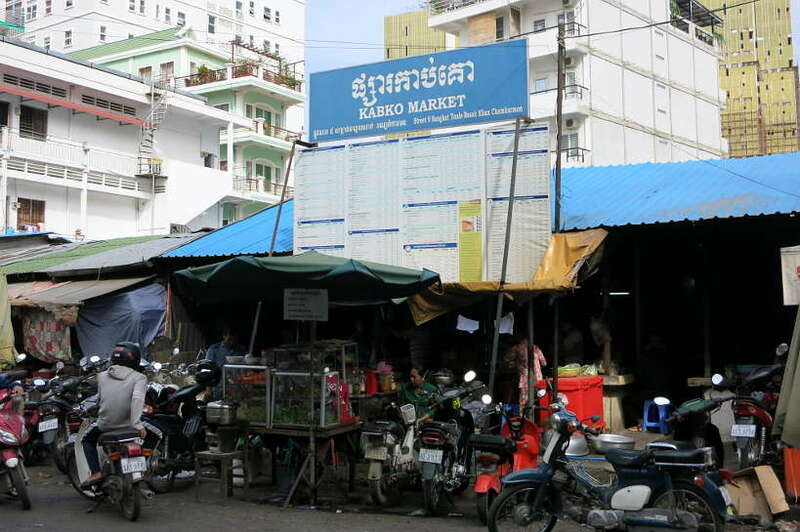 I would have loved to get to one of the local markets you mention, like Kandal or Kabko. 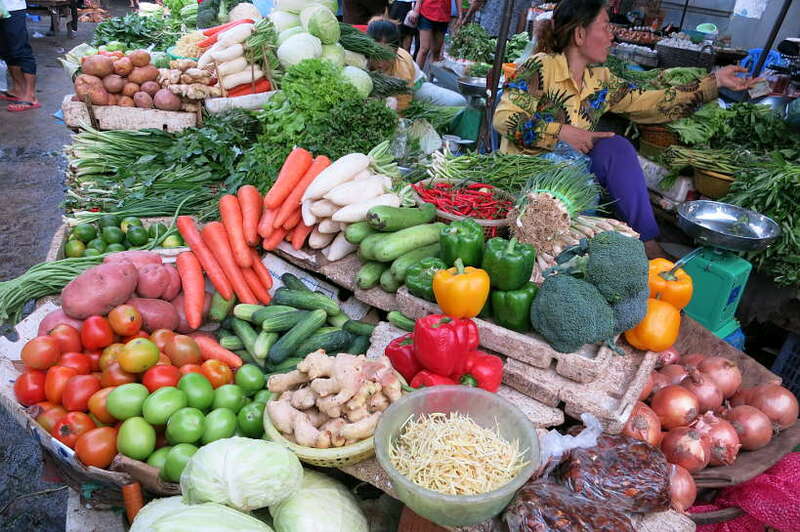 The markets are so diverse in Phnom Pehn that it is definitively worth going beyond the Central Market. Yes, the jewelry selection is quite incredible. Keep this list handy for your next trip to the Kingdom of Cambodia. Thanks for stopping by! That fruit you could not identify is called “Monkey Pod” or “Madras Thorn”. It is available in South India as well. Here, in tamil we call it seeni puliyangai. Awesome. Thanks so much helping us identify the fruit. It was the first time and only time we ever saw the fruit. Good to know it’s in South India. Do you like it? Thanks again Rajkumar!! We stayed right next door – literally – to the Central Market in 2012 Claire. I vividly recall the assault on our senses as we walked through LOL. Fun place. I loved it all save the stomach turning odor of sun-baked fish which seemed to permeate one side of the market. Cool recount here! All of these markets look amazing! I have been to some markets in Mexico & South America that could definitely be described as organized chaos! Sometimes I find markets a little overwhelming when they’re so big, but you just have to jump in and get involved! That’s right, Claire. At the local markets, it’s about just jumping in and going with the flow. What’s also nice is to see a variety of markets. From larger main markets to smaller neighborhood markets. It really gives a good sense of the local food culture. 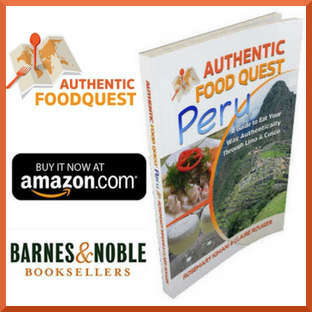 Did you have any favorite markets either in South America or Mexico? 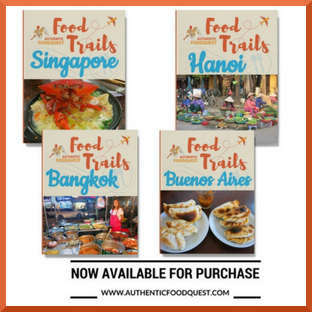 I love wandering around local markets and discovering new things as well as tasting local authentic food. 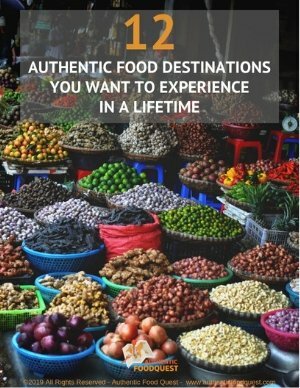 Such a great list of markets to explore. Thanks so much Anneklien. Nice to meet another market lover. Do you have any favorite markets? Any fun discoveries you’ve made. Stop back and do let us know. Appreciate your comments on the article. waffles! Am in for waffles! LOL. Nice post. Not really a foodie but I am willing to try their waffles! True, the waffles looked delicious, however, what stopped us and made us pause, was not knowing how long they had been out. If we were hungry at that particular time and they were made fresh right in front of us, we would have definitively jumped on them!! Thanks for stopping by Carla.